Pepstatin A is a specific and less toxic inhibitor for acidic proteases like Pepsin, HIV- und MMTV-Protease, Cathepsin D and Renin. Extracellular protease activities in cell cultures can be suppressed by using Pepstatin A in combination with Chymostatin. Our inhibitor Pepstatin A is of microbial origin and was isolated and purified from culture medium. Pepstatin A is always less soluble in usually used solvents. After an optimised down stream processing, Peptide Institute received Pepstatin A in excellent purity compared with higher solubility in commonly used buffers or solvents. Addition of small amounts of acidic acid to the buffer will increase solubility in many cases. The solvent can be heated slightly during dissolving process, since Peptstatin A is not very sensitive. 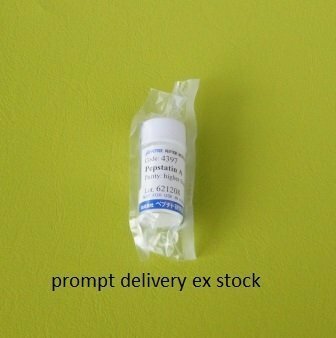 Our product Pepstatin A will be shipped at room temperature. Information about product specific storage conditions will be found on the vial. Stock solutions should be stored at -20°C. Please avoid repeated freezing and thawing by preparing aliquots. In the year 2003, the Japanese peptide manufacturer Peptide Institute started to distribute Pepstatin A with the purity “higher than 90%” when analyzed by RP-HPLC (Code 4397). This new inhibitor for Pepsin, HIV- und MMTV-Protease, Cathepsin D and Renin was highly welcomed by the majority of researchers. However, this accompanied some difficulties because of the low solubility of that inhibitor. At the beginning, we thought this low solubility is the destiny of the higher purity of our Pepstatin A. In striving to offer our customers satisfactory service, Peptide Institute continued to improve the solubility of this item. Recently, our lab has succeded to obtain both targets: high purity Pepstatin A and sufficient solubility. This new improved inhibitor Pepstatin A is now available from PeptaNova for soon delivery from our store in Sandhausen.